I really don't remember the last time I bought a baby gift. 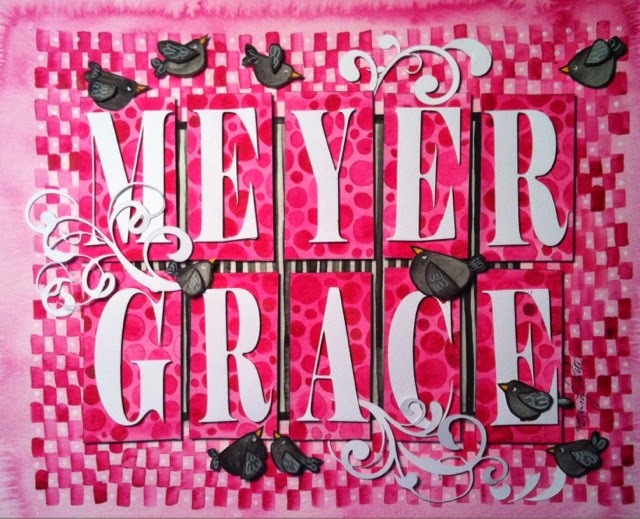 I generally paint a personalized watercolor for the special babies of friends and family. My middle daughter has a very tight knit group of friends who have been together since grade school. Many of them are in their thirties and just now starting their families. Each of these new babies are very special and very wanted. 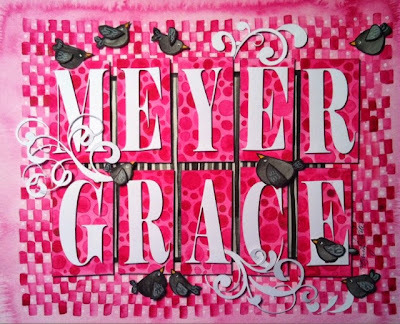 Today our community is celebrating baby Meyer Grace Johnson. This painting is dimensional with lots of little pieces cut out and built up. I like to paint a colorful background then add layers of painted pieces and embellishments. The nursery for baby Meyer is pink and gray and I didn't have much else to go on - no theme, just lots of pink. So I decided to create some funny little black birds and throw in a few cut out flourishes. Life has been unbelievably crazy. It has actually been weeks since I've been in my studio. Today it feels like fall on the prairie and there is even a little moisture falling. This kind of weather makes me want to create. I'll try to catch folks up on my adventures and travels. It's been a wonderful few months and I'm so happy to be back at work in my studio.